Vicky Duval is now the only American junior playing singles this weekend at Wimbledon, after the 16th seed beat Kateryna Kozlova of Ukraine 6-3, 6-2 today to advance to the girls quarterfinals. Kozlova, who received entry into the Wimbledon juniors based on her WTA ranking, which has been as high as 309, beat top seed Daria Gavrilova of Russia in the first round, but she trailed throughout her match with Duval. There was a stretch in the middle of the second set when Duval was tested on her service games, but she was broken only twice in the match, while Kozlova lost her serve six times. Next up for Duval is Australian Ashleigh Barty, also 15, who was down 4-2 in the final set against Madison Keys before taking the final four games in a 6-3, 6-7(5), 6-4 victory. Keys had three break point chances to take a 5-2 lead in the final set and serve for the match, but the No. 12 seed turned them away, and seized the momentum in the next game by breaking Keys to make it 4-4. Barty again saved a break point serving at 4-4, and Keys again couldn't hold after that chance was lost. Duval and Barty met in the final of the Grade 1 Astrid Bowl in Belgium in May, with Barty winning 6-2, 6-2 on the red clay. For more on Barty and her win over Keys, which avenged her loss at Roehampton, see Sandra Harwitt's article for the ITF junior website. 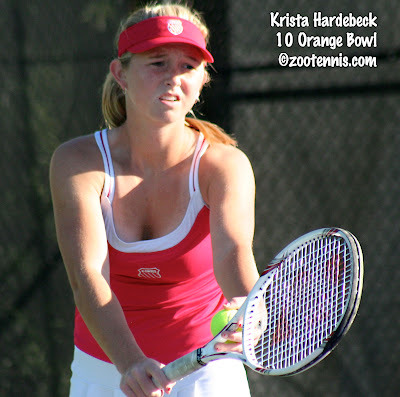 Krista Hardebeck, the third American girl to reach the round of 16, lost to No. 5 seed Eugenie Bouchard of Canada 6-3, 6-4. Unlike the boys draw, which has seen many upsets this week, the girls draw has gone primarily to form, with only Indy De Vroome reaching the quarterfinals unseeded. De Vroome, the 15-year-old from the Netherlands, is hardly a surprise however, as she won the Roehampton Grade 1 last week, and has yet to drop a set at Wimbledon. De Vroome will face No. 7 seed Yulia Putintseva of Russia, who beat Donna Vekic of Croatia 2-6, 6-2, 6-3 in today's round of 16. That will be a rematch of the Roehampton final, which De Vroome won 6-4, 6-4. Bouchard plays No. 3 seed Irina Khromacheva of Russia and in the other quarterfinal, No. 2 seed Caroline Garcia of France will face No. 6 seed Montserrat Gonzalez of Paraguay. Two of today's boys quarterfinals went into overtime, and because one featured British junior Liam Broady I was able to watch most of it on ESPN3. It would be difficult to describe the brand of tennis Broady and German qualifier Robin Kern played as traditional grass court, as there wasn't much net play, but the serve was the dominant force, with only four total breaks of serve in the 7-6(4), 4-6, 13-11 victory for Broady. Broady, who won the boys doubles title at Wimbledon last year, served for the match at 5-3 in the third, reaching match point, but Kern saved it with a rare net approach and volley winner, and Broady was eventually broken. With Kern serving at 5-6, he got down 15-40, but four consecutive big first serves, including a 125 mph ace, got the 17-year-old German out of that tight spot. According to the BBC commentators, Kern was occasionally serving in the mid-120s, and according to the match stats, even hit 133 mph on one of them. Broady kept cool however, and when Kern threw in two double faults serving at 11-12, Broady had match point number 4. This time Kern didn't get a first serve in and Broady was able to pressure him into a miss to claim his spot in the semifinals. Broady will play unseeded Jason Kubler of Australia, who was the top seed at the Wimbledon juniors last year. Kubler beat Julien Cagnina of Belgium 6-3, 6-1 in the quarterfinals. For more on Broady's win, see wimbledon.com. No. 8 seed Mate Pavic of Croatia fell to Kaichi Uchida of Japan 4-6, 7-6(7), 10-8 in another extended boys quarterfinal. Uchida will play No. 16 seed Luke Saville, who beat Joris De Loore of Belgium 6-7(1), 6-2, 6-2. The boys singles final is scheduled for Saturday, with the girls final and both the doubles finals on Sunday. After today's second round loss by Mac Styslinger and Connor Farren to Broady and his partner Filip Horansky, there are no US boys remaining in singles or doubles. There are three US girls still vying for a Wimbledon doubles title: Lauren Herring, Madison Keys and Grace Min. The unseeded Herring and Keys beat No. 3 seeds Barbara Haas of Austria and Anett Kontaveit of Estonia 6-1, 6-0 to reach the quarterfinals, while Min and her partner Bouchard, the No. 2 seeds advanced with a 6-3, 6-3 victory over Klara Fabikova and Aliaksandra Sasnovich of Belarus. For complete draws, see wimbledon.com. In college tennis news, former Georgia Tech assistant Aljosa Piric was named head men's coach at Old Dominion University. Piric, who was at Georgia Tech the past three years, replaces Darryl Cummings, who was head coach at the Norfolk Virginia school for 19 years. The complete release can be found at the Old Dominion website. Krista Hardebeck was the sole American junior of the four in action to advance in singles today at Wimbledon. Hardebeck defeated No. 10 seed Alison Van Uytvanck of Belgium 3-6, 6-3, 6-4 to reach the third round. Van Uytvanck has been one of the hottest players on the junior and ITF women's circuit this spring, so it was an excellent result for the 16-year-old Californian. Hardebeck took a 3-1 lead in the final set, lost three straight games, but held, broke and held to finish the match. She will play No. 5 seed Eugenie Bouchard of Canada on Thursday. Sandra Harwitt spoke to Hardebeck about her future plans in the daily ITF junior coverage of Wimbledon. Vicky Duval and Madison Keys, who won their second round matches yesterday, today found out who their opponents will be Thursday; No. 16 seed Duval will play unseeded Kateryna Kozlova of Ukraine, and Keys, who is unseeded, will play No. 12 seed Ashleigh Barty of Australia. They two Americans will meet each other in the quarterfinals with wins Thursday. The girls are a round behind the boys due to Tuesday's rain disruptions. Qualifier Catherine Harrison lost to No. 3 seed Irina Khromacheva of Russia 6-4, 6-7(6), 6-2 and Stephanie Nauta fell to No. 2 seed Caroline Garcia of France 6-2, 6-3. Marcos Giron, the only US boys to reach the round of 16, lost to Australian Jason Kubler, also unseeded, 6-3, 6-3. The boys will play their quarterfinal matches on Thursday, and after today's round of 16 matches, only three seeds remain, with No. 8 seed Mate Pavic of Croatia the highest. Great Britain's Liam Broady, seeded No. 15, repeated his Roehampton win over world No. 1 Jiri Vesely of the Czech Republic, taking a 6-4, 7-5 decision from the Australian Open boys champion. Broady will play German qualifier Robin Kern in the quarterfinals, after Kern surprised No. 5 seed Filip Horansky of Slovakia 6-3, 6-1. For more on Broady's win, see the Wimbledon junior news section. No. 16 seed Luke Saville of Australia, who reached the final in his home country's junior slam in January, finished his second round match today, then came back a few hours later to oust No. 2 seed Thiago Monteiro of Brazil 7-6(8), 6-3. The first round of doubles was completed today, and just one American boys team advanced--Connor Farren and Mac Styslinger. In the girls doubles, Orange Bowl champions Lauren Herring and Madison Keys of the US won, as did Duval and Grace Min. Duval is playing with Madagascar's Zarah Razafimahatratra as the fifth seeded team, while Min is playing with Bouchard and is seeded second. For the complete draws and Thursday's order of play, see wimbledon.com. Australian Open qualifier Bernard Tomic's winning streak at Wimbledon ended at seven when he fell to No. 2 seed Novak Djokovic 6-2, 3-6, 6-3, 7-5, but the 18-year-old can hardly be disappointed in his two and a half weeks in SW19. In this Times article published by The Australian, Tomic is confident this is just the beginning. More rain at Wimbledon, but a few windows of dry weather allowed three American juniors to make their way into the round of 16, helped by the brief duration of their matches. It took No. 16 seed Vicky Duval only 48 minutes to complete her 6-1, 6-2 victory over Beatriz Haddad Maia of Brazil, and Keys needed only 55 minutes to breeze past Zarah Razafimahatratra of Madagascar 6-2, 6-1. Marcos Giron took a more conventional amount of time to beat unseeded Pedja Krstin of Serbia 6-4, 6-2. Down 4-1 in the opening set, Giron found his form, winning five straight games and 11 of the last 13. He will play unseeded Australian Jason Kubler on Wednesday, after Kubler upset 2010 Wimbledon boys semifinalist Oliver Golding of Great Britain, the No. 4 seed this year, 7-6(7), 6-2. Last year, Kubler was the top seed at Wimbledon and it was Golding who took him out in the third round. Kubler has been injured and his only junior tournament since last year's Wimbledon was the US Open juniors. Unable to play in the Australian Open junior championships this past January, the 18-year-old did compete in three Futures tournaments in Spain during March of this year, but needed a wild card to get into the Wimbledon Juniors. I imagine Golding has some mixed feelings this evening about the LTA's generosity to a non-British player. The only other American* junior to finish today was Alexios Halebian, who lost to top seed Jiri Vesely of the Czech Republic 6-4, 6-4. Krista Hardebeck, Catherine Harrison and Stephanie Nauta did not take the court for their second round matches, which are now scheduled for Wednesday. *Sean Berman is listed from USA in the draw, as he is on the ITF site, but both he and Tennis Australia consider him Australian, so I do not include him in my counts. Only one boys match did not finish, so the boys will play their third round matches on Wednesday, but the girls will not, with only six of today's 16 matches decided. The doubles draw is also behind schedule, with only two girls and two boys doubles matches complete. It wasn't a good day for British boys, with six of them losing, including No. 10 seed and Orange Bowl champion George Morgan, who lost to Berman. Only Liam Broady, the Roehampton champion and No. 15 seed this week, remains in the draw to bolster British hopes. Belgium, on the other hand, can claim three boys through to the round of 16, all of them unseeded: Julien Cagnina, Kimmer Coppejans and Joris De Loore. For the complete draws and Wednesday's order of play, see wimbledon.com. The University of Michigan announced yesterday that rising junior Evan King has been invited to be a practice partner for the upcoming Davis Cup tie in Austin, Texas next month. King joins Bradley Klahn and Steve Johnson in helping Andy Roddick, Mardy Fish and the Bryan twins prepare for the Spanish team, which does not include Rafael Nadal, but does include left-handers Fernando Verdasco and Feliciano Lopez. Both King and Klahn are left=handed. King, a wild card at the $50,000 Winnetka Challenger, lost today in the first round, as did qualifiers Bradley Klahn and Michael Shabaz. Qualifier Denis Kudla did claim a win today. For the scores and other results, see the Pro Circuit page at usta.com. And finally, here are the finals results from the recently completed Southern Closed and Southern California Sectionals. For the complete draws of the Southern Closed, click on the age division below. For the complete draws of the Southern California sectionals, see this TennisLink site. The first round of the Wimbledon Junior Championships was completed today, with qualifier Catherine Harrison and No. 16 seed Vicky Duval making it five US girls through to the second round. Harrison beat Marie Elise Casares of Ecuador 6-2, 7-6(7) and Duval took out Miyu Kato of Japan 6-4, 4-6, 6-3 to join Krista Hardebeck, Madison Keys and Stephanie Nauta in the second round. Harrison will play No. 3 seed Irina Khromacheva of Russia on Tuesday, with Duval taking on Beatriz Maia Haddad of Brazil. Nauta will face No. 2 seed Caroline Garcia of France. Americans Gabby Andrews and Christina Makarova lost their opening round matches today, as did Dennis Novikov and Shane Vinsant. The biggest surprise in today's junior event was the exit of current French Open girls champion Ons Jabeur of Tunisia, the No. 4 seed, who fell to Risa Ozaki of Japan 4-6, 6-4, 6-3. Boys top seed Jiri Vesely of the Czech Republic advanced to the second round with a straight-set win over wild card Jonathan Cornish of Great Britain to set up a meeting with American Alexios Halebian. Marcos Giron, the only other American boy remaining in the singles draw, will play unseeded Pedja Krstin of Serbia in the second round Tuesday. There was plenty of buzz around Manic Monday at Wimbledon today in the men's and women's draws, with both Williams sisters exiting, but 18-year-old Australian qualifier Bernard Tomic managed to capture his share of the spotlight with a 6-1, 7-5, 6-4 victory over unseeded Xavier Malisse of Belgium to become the youngest Wimbledon men's quarterfinalist since 17-year-old Boris Becker won it in 1985 and repeated as champion the following year. Tomic will play No. 2 seed Novak Djokovic, with whom he has been practicing, in Wednesday's quarterfinal. For more on the Tomic win, see Greg Garber's article for espn.com. There is one correction, with Tomic's US Open boys title coming in 2009, not 2008, which was the year he won the Australian boys title. See wimbledon.com for complete results and schedules. In the final round of qualifying at the Winnetka Challenger today, Bradley Klahn advanced to the main draw with a 6-4, 7-6(3) victory over Devin Britton, while Denis Kudla beat Michael McClune 7-6(6), 6-7(2), 6-3. Michael Shabaz took out 2011 NCAA champion Steve Johnson 6-4, 6-7(2), 6-4. In the main draw, Jack Sock defeated Greg Ouellette 6-3, 6-2 and will play Michael Venus in the second round. See the Pro Circuit page at usta.com for the day's other first round scores. The complete release is available here. The ITA also released its All-Star team today, which will be part of the collegiate contingent invited to participate in Arthur Ashe Kids Day at the US Open. The names of those players, along with the National Arthur Ashe Leadership and Sportsmanship Award winners, can be found in this release at the ITA website. This is Wimbledon's middle Sunday, which means no play for juniors or anyone else at the All England Lawn Tennis Club, so it's a good time to catch up on the Pro Circuit results this week in the United States. 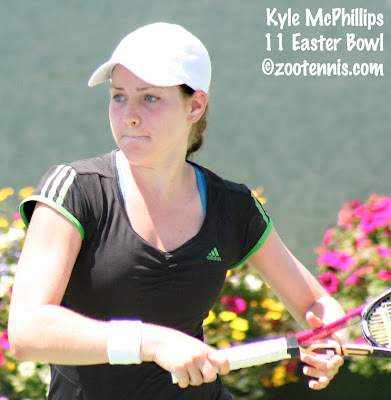 At the women's $10,000 tournament in Cleveland, local favorite Kyle McPhillips claimed her first professional title (as an amateur). The unseeded 17-year-old didn't lose a set in her five wins, and in the final, defeated qualifier Li Xi of China 6-3, 6-2. Brooke Austin and Brooke Bolender, also unseeded, captured the doubles title with a 7-6(2), 6-3 victory over No. 3 seeds Dianne Hollands of New Zealand and Shikha Uberoi of India. In the $10,000 men's event in Indian Harbour Beach, Fla., top seed Jesse Levine won his first title in over three years, beating five current or recently graduated collegians, all in straight sets. In the final, Levine beat qualifier Jeff Dadamo, the 2011 NCAA doubles champion from Texas A&M, 6-4, 6-4. The doubles title went to the unseeded pair of Mohd Assri Merzuki of Malaysia and Gabriel Moraru of Romania, who beat unseeded Antoine Benneteau and Artem Ilyushin 7-6(6), 3-6, 10-7. At the $50,000 women's challenger in Boston, unseeded Petra Rampre of Slovenia took the singles title, beating No. 2 seed Tetiana Luzhanska of Ukraine 6-4, 5-7 6-4. No. 2 seeds Luzhanska and Alexandra Mueller of the US beat top seeds Sharon Fichman and Marie-Eve Pelletier of Canada 7-6(3), 6-3. The qualifying for the men's $50,000 Challenger in Winnetka began with two rounds today, and Monday's final round of qualifying features some interesting matchups. The past three NCAA champions will be in action with 2009 winner Devin Britton against 2010 champion Bradley Klahn. Steve Johnson, the 2011 champion, will play Michael Shabaz less than a month after their semifinal encounter at the NCAAs, which ended with Shabaz retiring after he received a point penalty for ball abuse. Denis Kudla will play Michael McClune for a spot in the main draw, and in the only match that doesn't feature American vs. American, Laurynas Grigelis of Lithuania will play Luka Gregorc of Slovenia. The main draw also begins on Monday, and wild card Jack Sock will play former University of Florida All-American Greg Ouellette in one of the six first round matches scheduled. Qualifying is also underway at the $10,000 men's event in Innisbrook, Fla. and the $10,000 women's tournament in Buffalo, NY. The Wimbledon junior championships resume tomorrow with the remainder of the first round singles matches. 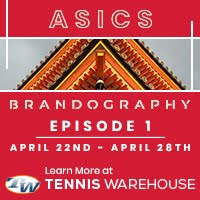 Americans Shane Vinsant, Dennis Novikov, Gabby Andrews, Catherine Harrison, Vicky Duval and Christina Makarova are hoping to join Marcos Giron, Alexios Halebian, Madison Keys, Krista Hardebeck and Stephanie Nauta in the second round. There are also a few doubles matches scheduled but those are in the "to be arranged" category. For Monday's schedule, see wimbledon.com. US Open girls champion Daria Gavrilova went out in the first round at the Grade 1 in Roehampton last week and her grass court season didn't get any better today, as the top-seeded Russian lost in the Wimbledon juniors opening round to Kateryna Kozlova of Ukraine 7-6(2), 6-3. Kozlova was playing in only her second junior slam--she lost in the first round at the recent French Open juniors--but it should be noted that her success on the professional circuit is what gained her entry into the French and Wimbledon. The 17-year-old had a WTA ranking of 309 at the time of acceptance, and although it has fallen to 354 now, just outside of the number that would have gotten her seeded, she obviously was a very dangerous first round opponent, not unlike Gavrilova's first round opponent at Roehampton, Krista Hardebeck. Hardebeck was one of the three US girls to advance to the second round today. She defeated Demi Schuurs of the Netherlands 6-2, 6-4, and Madison Keys, apparently recovered from the groin strain that kept her from finishing the tournament at Roehampton last week, also had a straight-set win, beating No. 8 seed Victoria Bosio of Argentina 6-4, 6-0. Stephanie Nauta also advanced with a tight 7-6(3), 7-6(6) win over British wild card Pippa Horn. Grace Min was the only US girl to fall in today's action; she lost to Sofiya Kovalets of Ukraine 7-5, 6-4. Two of the four US boys in action today advanced, with Marcos Giron and Alexios Halebian moving into the second round. Giron beat No. 14 seed Andre Artunedo Martinavarr of Spain 6-2, 7-5 and Halebian avenged his loss at Roehampton by defeating Bruno Sant'anna of Brazil 6-4, 6-4. Mac Styslinger lost to Belgian Julien Cagnina 7-6(4), 6-3 and Mitchell Krueger dropped a tough one to No. 8 seed Mate Pavic of Croatia 3-6, 7-6(5), 8-6. The most notable upset on the boys side today was the loss of No. 3 seed Hugo Dellien of Bolivia, who was beaten by Kaichi Uchida of Japan 7-6(4), 6-1. For today's results, as well as the singles and just-released doubles draws, see wimbledon.com. Eighteen-year-old qualifier Bernard Tomic of Australia continued his run in the men's draw, beating No. 5 seed Robin Soderling of Sweden 6-1, 6-4, 7-5 to advance to the fourth round. This article from Australia's Herald Sun drops some pretty big names in putting Tomic's accomplishment into perspective. I seem to recall John Newcombe doubting Tomic's prospects for the Top 50 not too long ago, but he has re-thought those comments in this article from the Sydney Morning Herald which was written prior to today's win. Pat Rafter's association with Tomic and his father John seems to be among the reasons for Tomic's recent surge. After today's win, he is projected to reach the Top 100 for the first time when the post-Wimbledon rankings are released. I had an opportunity to be part of a college tennis recruiting information panel that USTA Player Development put together at the NCAAs last month at Stanford. Although there was no way I could transcribe the entire presentation, panel discussion and question and answer session, I thought there was way too much good information there to confine it to those who could attend. I pulled out a few of the many great comments from the panelists into this feature for the Tennis Recruiting Network. If you think you might want to play college tennis, or your son or daughter might, please read it and then try to find an upcoming college forum or showcase in your section to attend. There is a lot of great information out there if you take a moment to find it. There was more rain today at Wimbledon, but it came late enough in the day so that the junior qualifying could be completed. Catherine Harrison and Dennis Novikov were the two Americans who qualified into the main draw. Harrison was not even in qualifying, but was an alternate when she went over to England for the two grass court events, so she has to be pleased to have gotten inside the AELTC gates. There are eight US girls and six US boys in the main draw, with eight of those 14 in action on Saturday. Madison Keys, who was injured and withdrew at Roehampton, is on the schedule for tomorrow, as is Roehampton semifinalist Krista Hardebeck, Stephanie Nauta and Grace Min. The other four US girls who will play their opening matches on Monday are Harrison, Christina Makarova, Gabby Andrews, and Vicky Duval, who is, at No. 16, the only US girl seeded. Keys plays No. 8 seed Victoria Bosio of Argentina, none of the others has drawn a seed. Interesting to note that French Open girls champion Ons Jabeur of Tunisia was given a wild card into the event, although she is the No. 4 seed and would obviously have had no difficulty obtaining entry through the normal means. Stephanie Myles, the Canadian tennis writer, reported today on twitter that Carol Zhao is not playing Wimbledon due to an computer entry problem, which is the same thing that happened to Shane Vinsant this year in Australia. The US boys playing Saturday are Alexios Halebian, Mac Styslinger, Mitchell Krueger and Marcos Giron. Halebian has drawn the same player who beat him in the opening round at Roehampton, Bruno Sant'anna of Brazil. Krueger gets No. 8 seed Mate Pavic of Croatia and Giron has drawn No. 14 seed Andre Artunedo Martinavarr of Spain. In addition to Novikov, who will play Roehampton finalist Evgeny Karolvskiy of Russia (a special exempt entry), Shane Vinsant is the other American boy set to start play on Monday. Top seeds in the tournament are the same as for Roehampton, Jiri Vesely of the Czech Republic, the 2011 Australian boys champion and Daria Gavrilova of Russia, the 2010 US Open girls champion. For the complete draws and order of play, see wimbledon.com. The ITF's preview of the Wimbledon juniors is available on their website. At Roehampton today, No. 13 seed Liam Broady of Great Britain and unseeded Indy De Vroome of the Netherlands were the somewhat unexpected winners of the ITF Grade 1, which is held alongside the Wimbledon qualifying. De Vroome beat No. 4 seed Yulia Putintseva of Russia 6-4, 6-4, while Broady took out unseeded qualifier Evgeny Karolskiy of Russia 6-2, 4-6, 6-1. In the girls doubles, No. 2 seeds Ashleigh Barty of Australia and Ons Jabeur won the title, but it looks as if the boys doubles rain into darkness/rain problems without being completed. For the Roehampton results and the complete results of the qualifying, see the LTA site. And congratulations to 18-year-old Australian Bernard Tomic, who has made the third round of a Grand Slam for the second time this year after a two-day, five-set, come-from-behind win over Russia's Igor Andreev. Tomic will play No. 5 seed Robin Soderling of Sweden on Court 1 Saturday. The weather here in Michigan, although apparently warmer, has resembled that of Wimbledon, with showers off and on most of the week. So I've watched a lot of Centre Court tennis on ESPN2, while turning to ESPN3 when a young player I've followed in juniors is on one of the televised outdoor courts. Today Christina McHale made a disappointing exit, losing to Austria's Tamira Paszek 6-4, 6-1 and Bulgaria's Grigor Dimitrov also lost, to No. 12 seed Jo-Wilfried Tsonga of France 6-7(4), 6-4, 6-4, 7-6(8), but the 20-year-old former Wimbledon boys champion played well, showing the English tennis fans why he has long been considered the next big thing. Ryan Harrison and Bernard Tomic of Australia had their matches suspended by darkness, with Harrison leading No. 7 seed David Ferrer of Spain 7-6(6), 1-6, 6-3, 2-4 and Tomic trailing Igor Andreev of Russia 6-4, 7-5, 3-6. Results and Friday's schedule can be found at wimbledon.com. With no roof to close at Roehampton, neither the boys Wimbledon first round qualifying or the Grade 1 boys semifinal matches finished. The Americans still remaining lost today, with No. 12 seed Vicky Duval falling to No. 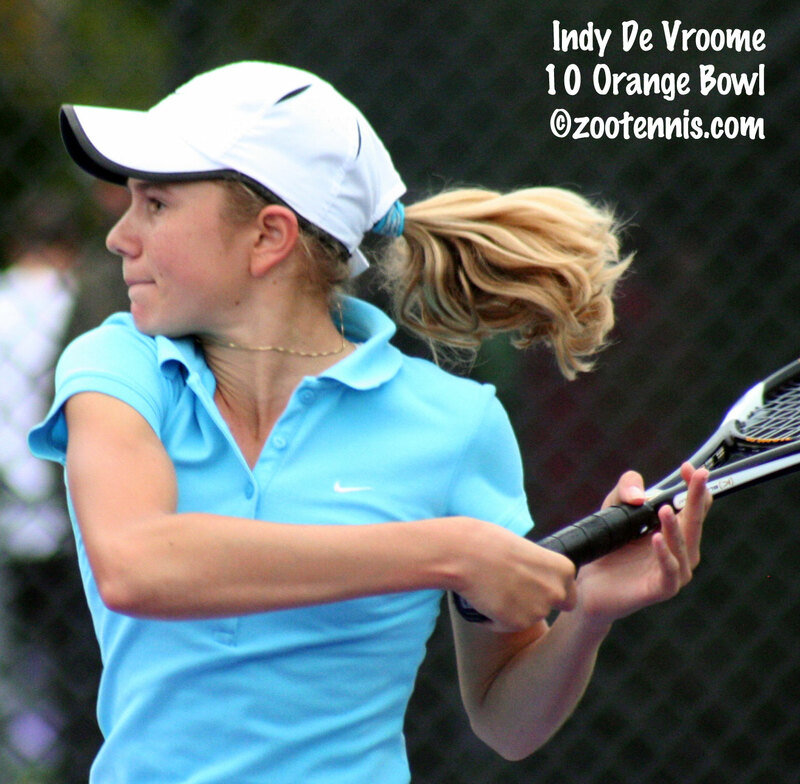 4 Yulia Putintseva of Russia 6-1, 6-7(6), 6-3 in the quarterfinals and Krista Hardebeck losing to unseeded 15-year-old Indy De Vroome of the Netherlands 2-6, 6-0, 6-4 in the semifinals. Marcos Giron lost to Russian qualifier Aslan Karatsev 7-5, 6-7(5), 6-4 in the quarterfinals. Karatsev and Evgeny Karlovskiy, aslo a Russian qualifer, were in the third set of their semifinal when the match was postponed. The winner of that match will play No. 13 seed Liam Broady of Great Britain, who defeated No. 6 seed Mate Pavic of Croatia 6-3, 6-2 in the semifinals. News was better in the Wimbledon qualifying, where five of the six Americans advanced to Friday's final round, and all were able to finish their matches. Andy Murray's mother tweeted from Roehampton (she was there as coach for junior Emma Devine) that there were no umpires, which is shocking news. Can anyone who was there today confirm that? I have only been to qualifying at a junior slam in New York, but they have chair umpires there, and very good ones too. I can't find any reference to junior slam qualifying in the ITF rules, and the ITF doesn't actually have the power to set rules at the junior slams (one of the things I learned when Sean Berman was listed as Australian in the 2010 AO, but remains USA to the ITF), so it probably makes sense that there is no reference to it. But even without a rule, it is absolutely critical to have chair umpires in grand slam qualifying. Back to the results, which saw all three US girls--Lauren Herring, Catherine Harrison and Elizaveta Nemchinov--advance to the final round of qualifying Friday. Dennis Novikov and Connor Farren had routine straight-set wins, but Emmett Egger fell to Nik Razborsek of Slovenia 6-4 in the third. For both Wimbledon qualifying and Roehampton results, see the LTA website. It was announced today by the Nielsen Pro $50,000 event in Winnetka, Ill. that Robby Ginepri and Jack Sock were recipients of main draw wild cards, and that Evan King's wild card into the qualifying was upgraded to the main draw for next week's tournament. For a story on Stanford recruit Robert Stineman, who received a qualifying wild card, see this article from PioneerLocal. The rain kept any play from happening at the ITF Grade 1 in Roehampton today, which is odd, because Wimbledon did get quite a few matches in despite a mid-afternoon start due to early rain. Krista Hardebeck did advance to the semifinals however, with Madison Keys, who had withdrawn from doubles earlier due to an injury, pulling out of singles as well, prior to her meeting with Hardebeck. Keys' Wimbledon participation is certainly in doubt now. Thanks to the twitter follower who let me know that Keys had withdrawn. Otherwise I might have missed seeing on the order of play that Hardebeck was awaiting her semifinal opponent. The juniors at Roehampton will share the courts there with the Wimbledon qualifiers on Thursday, weather permitting, and there are six Americans in the Wimbledon junior qualifying draws. Catherine Harrison, Elizaveta Nemchinov, seeded 15th and Lauren Herring, the fifth seed, are among the girls hoping to win two matches and advance to the main draw. Dennis Novikov(5), Connor Farren(8) and Emmett Egger are the US boys in Wimbledon junior qualifying. As I mentioned earlier, the strength of the boys draw is amazing this year, with an ITF ranking at the time of acceptance needing to be 103 or higher just to get into qualifying. By contrast, two girls from Great Britain in the mid-300s in the ITF junior rankings were accepted into the girls qualifying. With that kind of disparity, it's hard to know from year to year whether it's worth it to pay for the European airfare on the chance you may get in. And of course, just as is true for the men's and women's qualifiers at Wimbledon, you don't get into the gates of the All England Lawn Tennis Club unless you qualify. The grass there is reserved for main draw matches. For the complete draws, see the ITF junior site or the LTA site. The latter has the order of play. It doesn't look as if there will be live scoring however, which was an innovation at the US Open junior qualifying last year that I had hoped would become standard practice at the other junior slams. Seventeen-year-old Laura Robson, who has had a difficult year so far with injuries and poor performances, and last week parted ways with coach Patrick Mouratoglou, got a big lift today when she won her first round match at Wimbledon. The 254th-ranked wild card beat fellow left-hander Angelique Kerber of Germany 4-6, 7-6(4), 6-3, in a match that was available on ESPN3. Robson looked very comfortable in the second set, hitting a lot of outright winners on her forehand side, but she displayed some of the nerves that have plagued her in the big matches when she was serving for the second set at 5-4. Backhand errors and a double fault resulted in a break, but she held confidently at 5-6, and played well in the tiebreaker. She took a 4-0 lead in the final set, but lost both breaks, only to right herself by breaking Kerber at 3-4. There was none of the sloppiness or evident nerves that cost her the game serving for the second set when she served for the match, and she closed it out at love. It's her first singles win at a Slam after failing to qualify at three others, and losing to Daniela Hantuchova and Jelena Jankovic in Wimbledon first round matches the past two years. Next up for her, an even bigger name--Maria Sharapova. For today's results and Thursday's schedule, see wimbledon.com. Still nothing to report on the USTA collegiate team, but several college players are reported to have received wild cards into professional events. Wil Spencer of Georgia and Guillermo Gomez of Georgia Tech have received qualifying wild cards into the ATP Atlanta Tennis Championships next month, and Dennis Nevolo of Illinois and Evan King of Michigan have received wild cards into the qualifying of the Winnetka Challenger, joining Stanford recruit Robert Stineman. All three played their junior tennis in Illinois. The tournament just announced that James Blake has accepted a wild card into the main draw after his first round Wimbledon loss yesterday. All four American juniors competing in singles at the ITF Grade 1 in Roehampton won their third round matches today, meaning that Krista Hardebeck and Madison Keys will meet for a place in the semifinals. Hardebeck defeated No. 16 seed Ellen Allgurin of Sweden 6-3, 6-1, while Keys posted a 6-3, 6-4 win over unseeded Aliaksandra Sasnovich of Belarus. The last time Hardebeck and Keys played was at the Girls 18s Nationals last August, with Hardebeck taking a 6-7(1), 6-4, 6-2 decision in the quarterfinals. No. 12 seed Vicky Duval beat No. 8 seed Anett Kontaveit of Estonia 6-4, 6-4 today and will play No. 4 seed and 2010 US Open girls finalist Yulia Putintseva of Russia. Putintseva beat Duval in the first round at last year's US Open by a 6-4, 4-6, 6-1 score. Marcos Giron has reached the quarterfinals after a 7-6(3), 6-3 win over unseeded Mate Delic of Croatia and will face unseeded qualifier Aslan Karatsev of Russia, who beat No. 9 seed George Morgan of Great Britain in a third set tiebreaker today. It's the second time Karatsev has taken out a seed in a third set tiebreaker this tournament. It was a popular score for the boys today, as both Liam Broady and Oliver Golding of Great Britain also advanced by winning third set tiebreakers. Broady beat top seed and Australian Open boys champion Jiri Vesely of the Czech Republic, who has not played well since returning to the junior ranks this spring after several months on the Futures circuit. Grace Min and Stephanie Nauta are in the quarterfinals of the girls doubles. For complete results, see the LTA website. The ITF Juniors now has a Facebook page, which features photos and video interviews, including one from Catherine Harrison, who qualified at Roehampton. If you prefer to use Facebook rather than Twitter, you can get all the zootennis tweets as well as the link to my daily post by liking the Zootennis page. Today at Wimbledon, which was thankfully without any rain delays, Bernard Tomic of Australia and Ryan Harrison of the United States, two of the 1992 birth years who have received the most attention during their teen years, reached the second round with victories over players ranked much higher. Tomic, still 18, defeated Nikolay Davydenko of Russia, the No. 29 seed, 7-5, 6-3, 7-5, in a match that was available on ESPN3. I watched quite a bit of it, and thought Tomic served very effectively, while Davydenko was not at his best, making more unforced errors than usual. I also noticed Tomic looked less casual than usual, and was interested to read Tennis.com's Steve Tignor saying the same thing. From the start, he appears more focused, serious, and purposeful than I’ve ever seen him look in the past. He doesn’t force the issue in rallies, yet he controls them. Best are his passes and lobs when Davydenko moves forward; Tomic has that ability of the truly talented tennis player, to seem to hold the ball on his strings, like a man buttering toast. On match point, Davydenko approaches the net and Tomic sends the most delicate lob up and over him. The balls lands just beyond the service line, but the Russian is still nowhere near it. From the way he hit the shot, that’s exactly where Tomic wanted it to land. Tomic is a tennis player, but is he a world-class athlete? And which is more important these days? We’ll find out. For Tignor's complete report on the day's action, see tennis.com. Harrison, a lucky loser, and 37th-ranked Ivan Dodig of Croatia were not on a televised court, but ESPN's Pam Shriver provided updates for Patrick McEnroe, who was calling John Isner's straight-set win over Nicolas Mahut of France. Harrison won the match 7-6(5), 6-0, 7-5 and will play No. 7 seed David Ferrer of Spain in the second round. Harrison's temper is not just a topic of conversation on this site, but obviously throughout the tennis world. In this article from ESPN W, Harrison talks about his struggles controlling his emotions, and even Andy Roddick was quoted on the topic today. For the complete Wimbledon draws, see the tournament website. Maybe you're asking yourself, "What's up with you, American golf?" Ask it if you like, but the fact is, there is no such thing as American golf anymore, except for the week of the Ryder Cup. There's no Asian golf, there's no European golf. There's a global economy, there's a global water supply and there's global golf. Sir Nick Faldo, the English golfer who works for CBS and lives in Florida, watched Sunday's golf from a waterfront lodge in British Columbia. He traveled to China with McIlroy when Rory was 15 and has admired him ever since. "It's global golf now," Faldo said. "The players accept that. Where that hasn't been accepted yet is in the media." I hope I've accepted that in both golf and tennis, but I also hope it doesn't preclude me from devoting the majority of my attention to the juniors who live and play in the same country I do. Great Britain is trying to figure out why they have managed to produce the past two US Open champions in men's golf, but no grand slam men's singles champion since Fred Perry in 1936. The BBC investigates in this article entitled McIlroy and Murray: A tale of two 'middle-class' sports. Hardebeck, Duval, Keys and Giron Reach Third Round at Roehampton; McHale Wins at Wimbledon; Tiley Upbeat on Australian Tennis; US Tennis in Nosedive? Another wet day in London today, but the second round of singles at Roehampton did manage to finish, with three American girls and one American boy advancing to the round of 16. The first round of doubles is in various stages of completion at the moment. Krista Hardebeck, who defeated top seed Daria Gavrilova of Russia yesterday, beat British wild card Katy Dunne 6-0, 2-6, 6-2 today and will face No. 16 seed Ellen Allgurin of Sweden in the third round. Madison Keys, who beat No. 7 seed Ashleigh Barty of Australia 6-3, 6-4, will play unseeded Aliaksandra Sasnovich of Belarus. Hardebeck and Keys would play each other in the quarterfinals if both win on Tuesday. 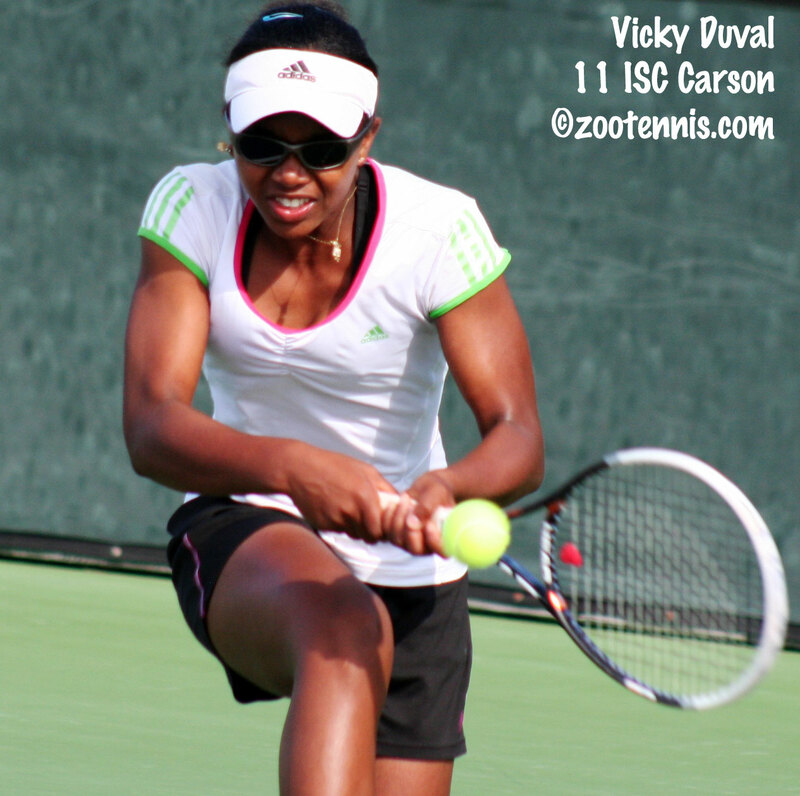 Vicky Duval, the No. 12 seed, is in the bottom half of the draw, and after her 7-5, 6-0 win today over unseeded Donna Vekic of Croatia, she will face No. 8 seed Anett Kontaveit of Estonia. Marcos Giron is the sole US boy remaining in the singles draw; he defeated No. 16 seed Diego Hidalgo of Ecuador 1-6, 6-3, 6-4 and will play unseeded Mate Delic of Croatia in the third round. For complete results, see the LTA website. Wimbledon began today, of course, and it was great to see Christina McHale put the memory of her first round match at Roland Garros out of her mind in a 2-6, 6-1, 8-6 win over No. 28 seed Ekaterina Makarova of Russia. McHale had seen a 5-0 lead evaporate against Italy's Sara Errani, and eventually lost that first round match 9-7 in the third. Serving for the match today against Makarova, who had double faulted on game point to give McHale the 7-6 lead, McHale went down 0-40 on her serve. But she located her biggest serves at just the right time and took the final five points of the match to advance to the second round of a Grand Slam for just the second time (first time was the 2009 US Open). For more on McHale's win see this article at usatoday.com. Craig Tiley, the Australian Open tournament director and head of player development in Australia, is quizzed about the prospects for men's tennis in this article by The Age. After Lleyton Hewitt's fall from the Top 100, Australia has no men in the ATP Top 100, and only four in the Top 200. Once criticized for not reaching out to the country's former champions, Tiley now can say "I don't think there's a former player that's not making a contribution to Australian tennis." I don't think the USTA can make that claim, but that doesn't come up in either of these two articles about the decline of US tennis. The first, from Reuters, is just the standard negative template that ignores the 12 US women in the main draw at Wimbledon, and refuses to give Bethanie Mattek-Sands any credit for working her way up to where she is now seeded in a Grand Slam. I wouldn't even bother to link to this except to contrast it with this one, from ESPN W, which starts out with the usual tired cliches, but actually gets around to raising some serious issues and possible causes for the recent decline in US tennis fortunes. Mark Miles, the former CEO of the ATP, admits the single-minded pursuit of a professional tennis career is not particularly appealing to the majority of upper middle class parents who can afford to fund it. Miles, who played collegiately at Wabash, and whose son is a college player, asks: "Would I have been willing to have a child drop out of life at age 12 and be committed to tennis? No. You don't have kids dropping out of life just to play Little League baseball. The best competition is organized within the school system. It is not true in tennis," Miles said. "We have to create competition at the 8-to-12-year-old level that is inexpensive and local with no travel. We have got to make it a game you can play while staying home and [being] in high school." Krista Hardebeck, who hasn't played a junior tournament since last year's Orange Bowl, got into the main draws at the ITF junior tournaments at Roehampton and Wimbledon this month based on her WTA ranking. Today in the first round of Roehampton, Hardebeck defeated current US Open girls champion Daria Gavrilova of Russia 6-4, 4-6, 6-1. Gavrilova, the No. 1 seed and No. 2-ranked junior in the world, has also brought her WTA ranking into the mid 300s, where Hardebeck's is, so there's no question it was a very tough draw for both of them. Other American girls advancing included Madison Keys, Grace Min, Stephanie Nauta and Vicky Duval. Half of the eight US boys in the draw at Roehampton advanced to the second round: Shane Vinsant, Emmett Egger, Marcos Giron and Connor Farren. Vinsant avenged his loss to Canadian Filip Peliwo in last year's Pan American Closed final with a 7-5, 3-6, 6-3 win today. Dennis Novikov and No. 3 seed Oliver Golding of Great Britain had a close contest as expected, with Golding getting through by a score of 4-6, 7-6(5), 6-2. For more on Golding and George Morgan, another British junior for whom expectations are great, see this article in today's Daily Mail. There is a confusing paragraph about their Queen's results, but it is Morgan, not Golding, who fell to Arnaud Clement in the qualifying there. One of the big surprises in today's results on the boys side was the loss of Halle champion Dominic Thiem of Austria, the No. 5 seed. Thiem was beaten by qualifier Aslan Karatsev of Russia, 7-6(6), 4-6, 7-6(4). For complete results from Roehampton today, see the LTA website. In the two Pro Circuit events completed today, top seed Philip Bester of Canada won the $15,000 Men's Futures in Chico, Calif., defeating No. 6 seed Blake Strode of the US 6-4, 6-2. Unseeded Vahe Assadourian of the US and Jimmy Wang of Taiwan won the doubles title, defeating unseeded Ed Corrie of Great Britain and Trevor Dobson of the US 6-4, 6-4. In the $10,000 tournament in Bethany Beach, Delaware, Lena Litvak of the US took the singles and doubles titles. Litvak, the No. 2 seed, beat top seed Maria-Fernanda Alves of Brazil 7-6(1), 4-6, 6-3. In the doubles final, Litvak partnered Alexandra Hirsch of the US and the No. 2 seeds beat top seeds Alves and Angelina Gabueva of Russia 7-5, 3-6, 10-8. Qualifying is underway at the three Pro Circuit events next week, with a $50,000 women's event in Boston, a $10,000 women's event in Cleveland and a $10,000 men's event in Indian Harbour Beach, Florida. See the Pro Circuit results page at usta.com for the draws. Beatrice Capra is the subject of this feature in the Baltimore Sun, which explores her decision to attend Duke rather than turn pro. Pam Shriver has a few comments, as does Duke's head coach Jamie Ashworth, and Capra says that her poor results this year may be attributable to putting too much pressure on herself. And finally, on Father's Day, it seems appropriate to provide a link to this feature about former Gustavus Adolphus College head coach Steve Wilkinson, who retired in 2009. Wilkinson, who was diagnosed with kidney cancer three years ago, and his wife Barb have stepped away from their roles at the successful tennis camp they created and are heading to Wimbledon as guests Eric Butorac, who competed for Wilkinson at the Division III school. The article explains that Wilkinson will still be providing coaching knowledge for Butorac's benefit. Congratulations to all the coaches out there who have made that kind of impact on the lives of those they've mentored, both on and off the tennis courts. Although today was hardly rain-free in London, Wimbledon qualifying was finally completed at Roehampton, with Alexa Glatch of the US the final player to earn her spot in the main draw. Glatch defeated Galina Voskoboeva of Kazakhstan 3-6, 7-6(2), 12-10 to join 11 other American women in the main draw, the largest number since 2007. In a disappointing lapse by wimbledon.com, the draws do not yet reflect where the qualifiers have been placed, but Kevin Fischer of the WTA tweeted that Glatch will play No. 8 seed Petra Kvitova of the Czech Republic, while Irina Falconi, who was fortunate to finish on Thursday, will play lucky loser Stephanie Dubois of Canada. Ryan Harrison lost to Cedrik-Marcel Stebe of Germany 7-5 in the fifth, getting broken at love after returning from a rain delay with Stebe leading 6-5. His frustration at losing led to an eruption that Guy McCrea described on Twitter: "Harrison smashed racket at end, huge divot in turf. Big fine likely." Harrison got into the main draw as a lucky loser however, just as he had done at the French last month. Robert Kendrick apparently withdrew, so that means there are still nine Americans in the main draw. Harrison and Travis Rettenmaier had already qualified in doubles; Lindsay Lee-Waters and Megan Moulton-Levy won their final qualifying match today. McCrea spoke with Stebe in his final qualifying podcast, and also talked with Conor Niland of Ireland, who in qualifying, becomes the first Irish player to compete in the main draw at Wimbledon since 1977. Niland played college tennis at Cal, where he was an All-American in 2006, reaching the quarterfinals in the NCAA individual tournament. The podcasts from the qualifying can all be found at wimbledon.com. The ITF Grade 1 in Roehampton begins on Sunday, with 16 American boys and girls competing in the main draws. The US boys in the main draw, none of whom are seeded, are: Mitchell Krueger, Shane Vinsant, Emmett Egger (a lucky loser), Dennis Novikov, Alexios Halebian, Mac Styslinger, Marcos Giron and Connor Farren. Novikov, who lost in the final of the Grade 2 Gerry Weber in Germany today, plays No. 3 seed Oliver Golding of Great Britain in the first round, a tough draw for both. The boys draw in Roehampton, as it is expected to be at Wimbledon, is extremely strong, with a world ranking of 20 required for seeding this week. Bjorn Fratangelo is one of the few top junior boys not playing the grass events this month. The US girls at Roehampton include two seeds, No. 12 Vicky Duval and No. 14 Grace Min. The other six are: Madison Keys, Stephanie Nauta, Krista Hardebeck, Christina Makarova, Lauren Herring and Catherine Harrison. Hardebeck plays top seed Daria Gavrilova of Russia in the opening round. Gabby Andrews, who is still listed in the Wimbledon entries, is not playing Roehampton. The girls' field at Roehampton and at Wimbledon is not as strong as the boys', with a ranking of 34 the cutoff for seeding this week. An-Sophie Mestach of Belgium, the world junior No. 1, withdrew from Wimbledon, as did Monica Puig, Natalija Kostic and Saisai Zheng. Complete Roehampton draws can be found at the LTA website. The ITA Summer Circuit begins next month at sites across the country, so junior and college players looking for more competitive opportunities this summer should find a local tournament that fits their schedule and sign up. I attended the final day of last year's tournament here in Kalamazoo (unfortunately this year it conflicts with the Clay Courts) and I was impressed by the relaxed atmosphere that still provided a competitive structure and plenty of match play. The article I wrote last year about the Summer Circuit can be found here. This year's schedule, which includes tournaments at 31 sites plus the National finals August 13-17 in Bloomington, Indiana, can be found at the ITA website. 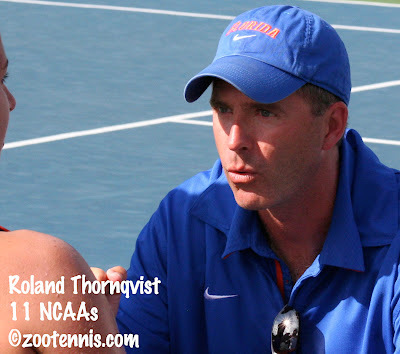 The University of Pennsylvania announced yesterday that long-time University of Minnesota coach Dave Geatz had been hired to lead the men's tennis program. Geatz, who coached the Golden Gophers from 1988-2006, coached at the University of New Mexico prior to that. Recently, he spent a year as the assistant at Ohio State, and as men's and women's coach at Cornell. Geatz replaces Nik DeVore, who resigned in April. Last week's Faces in the Crowd at Sports Illustrated featured NCAA champion Steve Johnson, this week two high school tennis players get their due. Alabama recruit Emily Zabor, who helped Walton High in Georgia win its eighth consecutive state title, and Stanford recruit Robert Stineman, who led Illinois' New Trier High to its second straight title, while winning his second consecutive state singles title, are featured here. It's been very damp in England, setting back the completion of Wimbledon qualifying yet another day, but the juniors appear to be on schedule at the Grade 2 Gerry Weber in Germany, with the finals set for Saturday. Dennis Novikov of the US has reached the final, where he will play French Open boys finalist Dominic Thiem of Austria, seeded No. 2. The unseeded Novikov beat the No. 5 and No. 3 seeds in straight sets on the grass, but was fortunate to have his semifinal opponent, Dennis Novak of Austria, retire when leading 7-5. Qualifying is nearly finished for Roehampton, the Grade 1 that precedes Wimbledon, with Emmett Egger and Catherine Harrison the only US players attempting to make the main draw. Egger lost his second round match, but Harrison has qualified. I don't know if they escaped the rain or played indoors, but results of the qualifying can be found at the LTA website (on the righthand side). In the $10,000 Women's Pro Circuit event in Delaware, unseeded 16-year-old Denise Starr has reached the semifinals. On Saturday she will play No. 2 seed Lena Litvak for a place in the final. Irina Falconi won her final Wimbledon qualifying match today, one of only four women who were able to secure their spots in the main draw between rain showers. With her 6-3, 6-2 victory over Junri Namigata of Japan, Falconi has now qualified for all four Grand Slams since she left Georgia Tech a year ago. She has gone a perfect 9-0 in qualifying at the US Open, Australian Open and Wimbledon, and won the USTA's wild card tournament to earn her place in the French Open. She has yet to win a main draw match in a slam, but she was very impressive in qualifying this week, dropping only 12 games in three matches, so maybe Wimbledon will be the site of her first win. She is again blogging for usta.com, which she's been doing pretty much non-stop the past six weeks, and according to this WTA "Getting to Know" feature (which I missed while I was busy at the NCAAs) we know why she's agreed to write so much. "I'm a big writer...I love to write." The remaining qualifying matches will be played on Friday. Lindsay Lee-Waters lost, and Alexa Glatch did not start her match. Ryan Harrison will need to come from two sets down (men's final qualifying matches are best of 5) if he is to qualify. Cedrik-Marcel Stebe of Germany came back from 4-1 down in the second set against Harrison to take a 6-3, 7-5 lead. The draw is set to take place at 10 a.m. (5 a.m. Eastern) and can be followed at wimbledon.com. The second annual Maureen Connolly Challenge Trophy competition is underway in Eastbourne with girls 18-and-under teams from US and Great Britain facing off. The US team consists of Vicky Duval, Krista Hardebeck, Madison Keys, Grace Min and Christina Makarova, while Great Britain's team is Daneika Borthwick, Lucy Brown, Katy Dunne and Fran Stephenson. The US won three out of the four singles matches today and split the two doubles matches. For more on today's play, see the LTA website. In another exhibition tournament prior to Wimbledon, this one in Liverpool, LSU's Neal Skupski surprised 45th-ranked Andrey Golubev 6-4, 6-3. Neal is the younger brother of Ken Skupski, an All-American at LSU, who is now playing doubles on the ATP tour. Neal Skupski was officially pronounced an All-American himself today, with the ITA releasing the list for 2011. The complete list is here. Below are the players who were All-American in both singles and doubles. For the complete draws in the 14s, 16s, and 18s see the TennisLink site. For all the 10s, and 12s results, see this TennisLink site. The US Davis Cup team takes on Spain next month in Austin, and although the players for the teams have not been announced, Andy Roddick, Mardy Fish and the Bryans are expected to compete, as is World No. 1 Rafael Nadal. Given that the tie begins only five days after Wimbledon ends, six time zones away, Nadal's participation may contain an element of doubt. But in any case, Bradley Klahn of Stanford and Steve Johnson of USC have been selected as the hitting partners for the US team, and will spend the week in Austin assisting the team in preparing for Spain. All the reports I've gotten from those who have been with the Davis Cup and Fed Cup teams as hitting partners have been glowing in their praise of the experience, so I'm sure Klahn and Johnson are thrilled to be included in this high profile tie. For more on the possible matchups, see this Austin American-Statesman article. Three more US Open Sectional Playoffs were completed last week, and UCLA recruit Robin Anderson earned her spot in the National Playoffs by winning the Middle States sectional with the loss of only 4 games. Nathan Healey won the men's tournament and teamed with Boston College's Veronica Corning to win the mixed title. In the Pacific Northwest, Marie-Eve Pelletier of Canada and Aleksandar Vlaski of Serbia won the women's and men's tournament and partnered for the mixed doubles title as well. In the Intermountain section, Vasilisa Bardina and Angelo Faustino were the women's and men's winners, with Miika Keronen, and Yana Ruegsegge winning the mixed competition. For the complete list of winners, see the usopen.org website. Registration for the final sectional qualifying, in the Southern section, closes next Monday, June 20. The third day of Wimbledon qualifying saw three American women advance to Thursday's final round: Irina Falconi, Alexa Glatch and Lindsay Lee-Waters. They join Ryan Harrison, who is the only American man reaching the third and final round of qualifying. Falconi beat Romanian's Elena Bogdan 6-2, 6-2 today, and Guy McCrea spoke with her after the match for his daily Wimbledon podcast. He asked her about her college experience and she mentioned again one of the points she brought up in a press conference in Midland this year--that she knew she would get another match after a loss, and still have a scholarship. Falconi plays No. 13 seed Junri Namigata of Japan in the final round of qualifying. The complete order of play can be found at wimbledon.com. News of British tennis always spikes this month, and BBC Sport is looking for Andy Murray's successors, even though he's only 24. James Ward, Dan Cox and Dan Evans are discussed with LTA's Leon Smith, and so are the junior boys, particularly Oliver Golding and George Morgan. It was revealed today that 17-year-old Laura Robson has parted ways with Patrick Mouratoglou, with whom she had been working only since the end of last year. 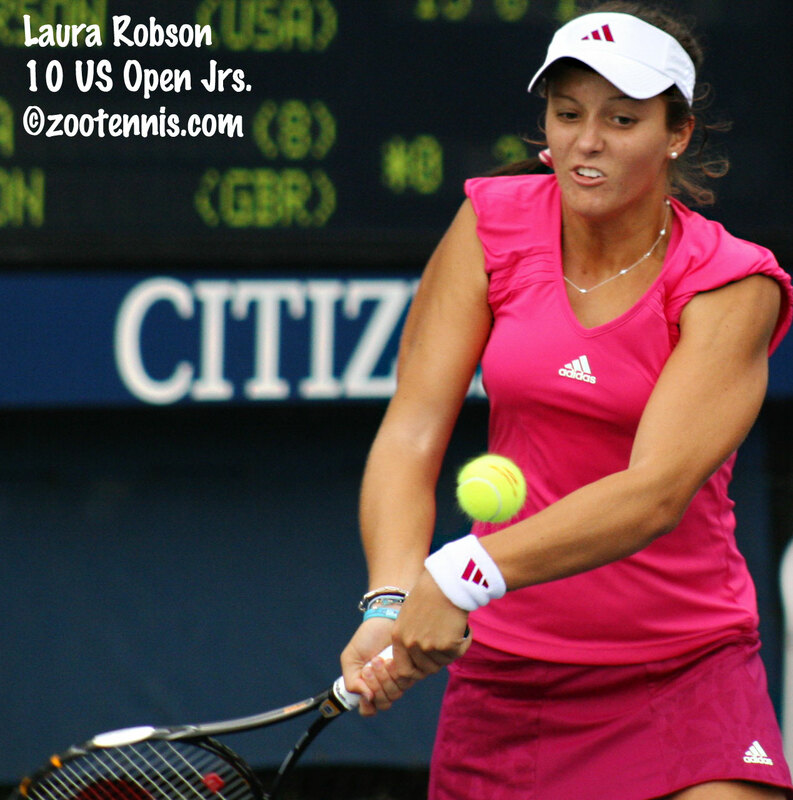 Robson's ranking hasn't kept pace with Heather Watson's, who is 20 months older, and now at No. 93 in the WTA rankings. Both received main draw wild cards into Wimbledon. I don't follow collegiate golf, but I do have an interest in professional golf, so I know that many of the international men and women on the PGA and LPGA tours developed their games at American universities. In today's Los Angeles Times, Diane Pucin investigates the globalization of the individual sports of golf and tennis and why the US is no longer likely to return to its hegemony in either sport. She also quotes Daniel Coyle, whose book The Talent Code: Greatness Isn't Born. It's Grown. Here's How changed the way I think about that loaded word talent. Although this isn't a quote I've heard from Coyle before, it seems to hit the target. "Here in the U.S., we've fallen in love with the idea that athletic talent is a gift," he said. "That's a beautiful idea, that a baby is born with a gift, that a Michael Jordan had a divine spark, or that Serena Williams is so gifted that she can just go out and sell tennis shoes. But guess what? Turns out, that idea is fundamentally wrong." USTA's Patrick McEnroe is interviewed about the pitfalls of identifying "talent" too early and again refrains from naming any names when asked about promising juniors. Pucin did make a trip to the women's $50,000 Carson Pro Circuit event last month however, and spoke with Gabby Andrews and her father for the article, while Michael Joyce, the former pro and coach of Maria Sharapova, does throw out a few names, including Andrews, Taylor Townsend (who reached the semifinals in Carson), and his pupil, Jessica Pegula. (There is an error in the story where Pucin says Andrews won the Easter Bowl. She won the doubles, but she was beaten in the singles final by Kyle McPhillips). I would guess that Michael Joyce didn't "see any soon-to-be stars among young American men" primarily because he works in women's tennis, not because there aren't any. But maybe the key is the "soon-to-be" part. Bruce Jenkins, who covered the Stanford - Florida NCAA women's championship match for the San Francisco Chronicle last month, wrote today for Sports Illustrated about not just the benefits of the college tennis development path, but about the fun and excitement of the sport on that level. Patrick McEnroe (who has obviously been busy giving interviews) estimates that the US might have lost "about a hundred potential top-100 players" (seems high, but dozens, certainly) who skipped college and turned pro before they were ready. He mentions Virginia's Michael Shabaz as an example of a player who didn't make that mistake, and of course, John Isner is now the poster child of college tennis, although South African Kevin Anderson, who spent three years at Illinois, is currently the highest-ranked former college player at 38. With the entire article so positive and upbeat about college tennis, I feel a bit embarrassed to bring up a point I dispute, but I'll do it anyway. In the final paragraph, Jenkins says, "Isner's enviable career path doesn't seem to have had much impact." I don't know what he's basing that statement on, but I disagree. What Isner (and Anderson and Somdev Devvarman) have shown in the past four years--that a viable, productive professional career is possible after three or four years of college--has made college tennis a very attractive option for juniors with professional aspirations. Would Chase Buchanan, Rhyne Williams, Jarmere Jenkins, Evan King, Raymond Sarmiento, Alex Domijan, Tennys Sandgren have gone to college without that example? It's a question we'll never answer definitively but I don't understand how Jenkins can dismiss Isner's influence on young Americans (or international players, for that matter) as they contemplate their career path. One of the most recent collegiate success stories wasn't mentioned in Jenkins' article and that's Irina Falconi, who at this time last year was just announcing her departure from Georgia Tech. Since then Falconi has qualified for the US Open, the Australian Open and won the USTA's French Open wild card, and she is now ranked 111. Falconi, the No. 4 seed in the Wimbledon women's qualifying, beat Anna-Lena Groenefeld of Germany 6-3, 6-0 to advance to Wednesday's second round, where she'll play Elena Bogdan of Romania. Falconi is one of four US women in the second round, with Alexa Glatch, Lindsay Lee-Waters and Sloane Stephens also advancing in straight sets. Ryan Harrison, who won his second round match today, is the sole American man still contending for a main draw spot. Guy McCrea's podcast from Day Two at Wimbledon qualifying features Marina Erakovic of New Zealand, Caroline Garcia of France and Frank Dancevic of Canada. Garcia, who is entered in the Wimbledon Junior Championships, reaffirms her intention to play the junior slams this year, which means a final attempt at a US Open title, after falling to Ons Jabeur of Tunisia last year in the quarterfinals. The draws for qualifying can be found at wimbledon.com. The first round of men's qualifying at Wimbledon is complete, and of the seven Americans in the 128 draw, only two have survived: Alex Kuznetsov and Ryan Harrison. Lester Cook, Bobby Reynolds, Jesse Witten, Zack Fleishman and Rajeev Ram lost their opening matches at Roehampton, the site of the qualifying. Harrison, the No. 14 seed, came back to defeat British wild card Alex Ward 6-7(4), 7-6(4), 6-3, and will play Laurent Rochette of France in the second round. Kuznetsov also lost the first set but came back to beat Gianluca Naso of Italy 4-6, 6-1, 6-2. Two British juniors who received wild cards also advanced to the second round with Oliver Golding beating fellow wild card Josh Milton 6-3, 6-2 and Liam Broady upsetting No. 31 seed Alessio Di Mauro of Italy 6-3, 1-6, 12-10. Guy McCrea is doing his daily podcast from qualifying for wimbledon.com and he spoke with Broady, Harrison and Australia's Matthew Ebden in today's show. Harrison's coaching situation is one of the questions McCrea raises, and Harrison reveals that he is working with Sam Querrey's former coach Grant Doyle as well as Scott McCain and his father Pat. Women's qualifying begins on Tuesday, with six American women in the draw: Julia Cohen, Lindsay Lee-Waters, Irina Falconi(4), Madison Brengle, Alexa Glatch and Sloane Stephens(12). For draws and results, see wimbledon.com. Earlier today, I tweeted a link to this Sacramento Bee article about Daniel Kosakowski's win at the Sacramento Futures, which says that Kosakowski had decided to turn pro. The rumor he was not returning to UCLA in the fall had been circulating since early April. And although I don't think this qualifies as a bona fide Sports Illustrated jinx, USC's Steve Johnson, who lost to Kosakowski in the final yesterday, his first loss since March, is featured in this week's Faces in the Crowd. "It's just a matter of seeing what happens," Fratangelo said. "The ultimate goal is to turn pro, make men's Grand Slam events and win. If I feel like my game gets good enough, I'll move to the pro level. If I need to develop more, I'll do that in college. Tennis is an up-and-down sport. One tournament doesn't make a career." 2007 NCAA champion Audra Cohen, who is coaching the USTA women's collegiate team along with Jamea Jackson of Oklahoma State this summer, has accepted the women's head coaching position at Jacksonville's University of North Florida, a Division I school in the Atlantic Sun conference. The complete release can be found here. Anna Mamalat defended her title at the ITF Grade 4 International Grass Court Championships at the Philadelphia Cricket Club Saturday, defeating No. 7 seed Chanelle Van Nguyen 6-4, 6-3. Mamalat travels very little and has only played three tournaments this year: two on the women's Pro Circuit, where she lost in the first round, and the Grass Courts, which are near her home. Third seed Trey Strobel won the boys title, defeating unseeded 13-year-old Stefan Kozlov in the final 6-2, 6-4. Strobel, who has won two other ITF events in the past 12 months, is a left-hander who can volley, so he has the game style to do well on the Cricket Club courts. Unlike the current flawless surface at Wimbledon, the courts at the Cricket Club have dead spots, odd bounces and don't provide a high bounce, so if you can volley, you can eliminate one of the sources of frustration. Strobel and partner Luca Corinteli, the No. 2 seeds, won the doubles title over unseeded Daniel Khanin and Javier Restrepo 6-4, 6-4. Van Nguyen and her partner Kyle McPhillips, who won the Grass courts doubles title in 2009, did so again on Friday. The top seeds beat No. 2 seeds Blair Shankle and Denise Starr 7-6(5), 6-4. At the $15,000 Sacramento Futures, unseeded Daniel Kosakowski broke his losing streak against NCAA champion Steve Johnson, taking his first Pro Circuit title with a 6-4, 2-6, 6-3 victory over his Pac-10 rival, who was the No. 8 seed this week. Kosakowski, who just completed his freshman year at UCLA, had lost four matches to USC's Johnson this year, including a comprehensive 6-2, 6-1 loss in the second round of the NCAA individual tournament just over two weeks ago. Recent NCAA semifinalists Alexandre Lacroix and Sekou Bangoura, Jr. of Florida won the doubles title, beating James Ludlow and Ty Trombetta 6-4, 7-6(3). In the women's $25,000 in El Paso, Chi Chi Scholl won both the singles and doubles titles. Scholl had reached the finals of a $10,000 and two semifinals in $25,000s this year in singles, but today marked her first Pro Circuit championship. She also claimed her first doubles title, teaming with Alyona Sotnikova of Ukraine for a 7-5, 4-6, 10-8 win over Amanda Fink and Yasmin Schnack. For complete results and the qualifying draws for next week's events, see the Pro Circuit page at usta.com. Barely a week after the finish of the French Open, the men's qualifying begins for Wimbledon tomorrow. There are seven American men in the qualifying draw: Rajeev Ram, Bobby Reynolds(24), Alex Kuznetsov, Ryan Harrison(14), Jesse Witten, Lester Cook and Zack Fleishman. As I tweeted earlier today, the 31-year-old Fleishman hasn't played since the 2009 US Open qualifying and is listed as inactive on the ATP site. See Wimbledon.org for the men's qualifying draws in singles and doubles. Because I chose not to cover the Grass Courts this year, I've had time to do a more comprehensive NCAA slideshow than I've been able to do in the past. I think you'll agree there are some fantastic photos, thanks to the Northern California light and my husband Paul, who took most of the good ones. Videos of finalists Rhyne Williams and Stacey Tan are also available at the tenniskalamazoo YouTube channel. As I mention at the end of the article, there is still time to enter the Southern section's qualifying tournament, which will be held July 1-6 at the Windward Lake Club in Alpharetta, Ga. Entries close June 20. See the TennisLink site for more details. Juniors and college players have done very well in the sectional qualifying that has been completed. Skylar Morton defeated Spencer Liang in the final of the Mid-Atlantic qualifying and also won the mixed doubles with Virginia Tech's Patrick Daciek. Former Elon player Damon Gooch won the men's qualifying. For more on that see the section's article. Sixteen-year-old Caroline Dailey won the women's event at the Florida qualifying. 2010 UCLA graduate Yasmin Schnack collected the women's title and the mixed (with Eric Roberson) in the Northern California tournament, with former Minnesota standout Chris Wettengel defending his men's title. Last year's men's national winner, Blake Strode, won the men's and mixed (with Whitney Jones) in the New England section, with former Harvard player Lena Litvak taking the women's title. Former USC Trojan Maureen Diaz won the Hawaii-Pacific women's title and the mixed (with Erik Nelson-Kortland). Angelo Niculescu, who played at the University of South Carolina, won the men's Hawaii-Pacific event, after having won the Pacific Northwest tournament last year. Complete results can be found here and by clicking on the section links, you can go to the TennisLink sites for the draws and results of the tournaments, or to see who has entered in the upcoming ones. The Northern section has former Virginia star Treat Huey pairing with former William and Mary standout Megan Moulton-Levy in the mixed. Both are currently playing on their respective professional tours right now, but are not relying on getting in on their own rankings. There wasn't much suspense in the selection of the Campbell/ITA Players of the Year, with Cal's Jana Juricova and USC's Steve Johnson, the NCAA champions and top-ranked players officially named today. For the complete release, see the ITA website. Speaking of Johnson, a reader brought to my attention yesterday the fact that Johnson's 35-match winning streak is a collegiate one, so it is not extended by his wins in Futures competition. Johnson, who lost in the first round of qualifying at the BNP Paribas Open in Indian Wells in March (to Canadian Frank Dancevic) beat Alexandre Lacroix today 6-3, 6-3 at the Sacramento Futures, to set up a quarterfinal meeting Friday with top seed Philip Bester of Canada. Dan Kosakowski and Guillermo Gomez, who also competed in the NCAA individual tournament last month, are through to the quarterfinals as well. Johnson and Lacroix will meet again in the doubles semifinals, with Johnson partnering Texas grad Ed Corrie and Lacroix with teammate Sekou Bangoura, Jr. The growing potency of D-III teams is being felt most acutely in men's tennis. As the D-III men's championships got under way last week, coaches and players say (and the results suggest) that the top men's D-III teams are now better than about half the teams in Division I, and can hang with all the D-I teams outside the top 50. I don't see Top 10 Division III men's tennis on a regular basis, nor do I see much D-I tennis outside the Top 50, so I can't really argue either side of this statement. But I'd like to see more examples of the results suggesting this is the case, if anyone can recall recent meetings between them. I know Western Michigan always beats Kalamazoo College when they play, but that's the extent of my basis for comparison. The Women's ITA Kickoff Weekend draft took place today, and so many teams opted out that unranked teams got to bid. Not only did No. 1 Florida and No. 2 Stanford pass, which are obviously the most significant absences, but so did four other Top 40 teams, including Pepperdine(25), SMU(29), Long Beach State(36) and Cal Poly(39). There are probably as many reasons for this as there are schools declining the opportunity--budgets, schedules, academics among them, but it is disappointing for a college tennis fan. From the draft, it looks as if no one wanted to go to Durham to play Duke's No. 1 recruiting class, as No. 64 Winthrop is the No. 2 seed in that group. Baylor also attracted a very weak field with No. 66 UT-Arlington their second seed. Of course, these numbers are this year's rankings, and a lot can happen in the next eight months to change the perception of the regionals' strengths. For the complete breakdown of who is going where, see the ITA website. And finally, I just came across this article announcing that former Vanderbilt star Julie Ditty is retiring, not from tennis, but from the professional tour. 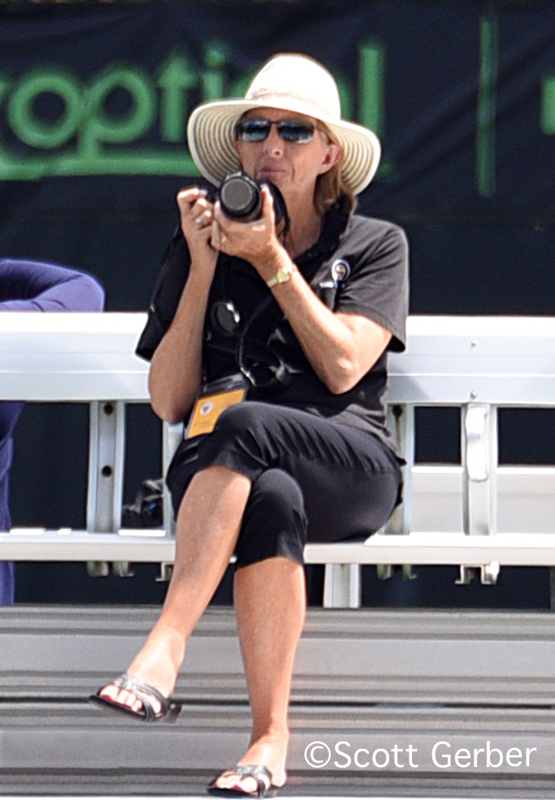 She has taken a position as Director of Tennis at the Bellefonte County Club in her home town of Ashland, Kentucky. I'm not quite ready to close out the 2010-2011 college season (an NCAA slideshow is still on the way, probably this weekend), but once the awards and final rankings are announced, there isn't much left to report, other than the USTA collegiate team selections. Florida's Roland Thornqvist was named the Wilson/ITA women's Coach of the Year after leading the Gators to the NCAA title last month. 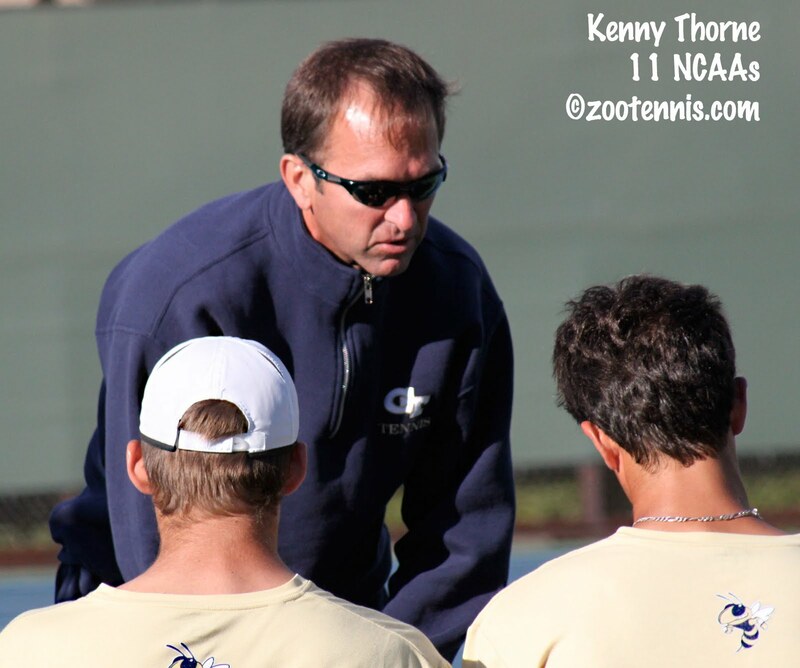 The men's Wilson/ITA coach of the year is Georgia Tech's Kenny Thorne, whose team finished 13th in the final rankings. Both are first-time winners. The list of the names of the last 12 winners makes it clear that winning the national title is hardly the only criteria for the award, especially on the women's side. The complete release can be found at the ITA website. For those of you who missed the announcement of the National Assistant Coaches of the Year, Bob McKinley of Texas A&M and Sara Anundsen of North Carolina were the 2011 winners. NCAA champion Jana Juricova of Cal was today announced as the winner of the Honda Sports Award for tennis. For more on that honor, see the Cal website. Juricova and Steve Johnson of USC finished at the top of the final singles rankings, with JP Smith and Boris Conkic ending at No. 1 in the men's doubles, despite failing to win any of the three collegiate majors. Texas A&M's Jeff Dadamo and Austin Krajiek, who won the USTA/ITA Indoor and the NCAAs, finished second in the rankings. Alex Domijan's first round loss at the NCAAs knocked him from No. 2 to No. 4 in singles, with Virginia's Michael Shabaz finishing No. 2 and Rhyne Williams of Tennessee No. 3. NCAA champions Hilary Barte and Mallory Burdette of Stanford finished atop the women's doubles rankings, with Cal's Mari Andersson and Juricova finishing second. Barte finished No. 2 in singles, followed by Maria Sanchez of USC and Allie Will of Florida. The complete final rankings can be found at the ITA website. Next January seems like a very long time from now, but today was the men's draft for the ITA Indoor Kickoff Weekend, which is scheduled for the last weekend of January 2012. Both the men's and women's 2012 Team Indoor Championships will hosted by the University of Virginia on two consecutive February weekends. All of the top 15 men's teams elected to host (Virginia doesn't need to, since they get in automatically). The lowest ranked team to get in the draw was Purdue, at No. 64. Arizona, Idaho and Drake, all eligible ranking-wise, elected not to participate. See the ITA website for who will be going where. The women's draft is Thursday.